I had a significant amount of alterations done to account for my VERY petite stature. I am 4'11" tall, and in this dress I was wearing 3" heels. 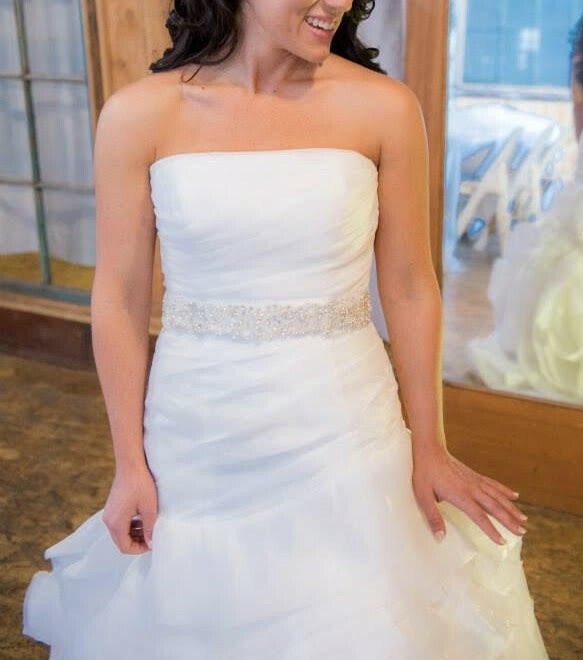 This dress is perfection for petite brides out there! I spent around $900 making sure I could cut several inches off the bottom of the dress without compromising the dramatic bottom. It is stunning, and if you are a petite bride, you need this dress. I also had to top taken in a bit to get me closer to my street size of a 2. The top was not taken in very much, the main alterations were to make this a petite dress on the bottom. I also added a jeweled belt, which is affixed to the dress and cannot be removed. It is the perfect addition to the look!